While looking through a bunch of forgotten photos from my old 4 megapixel digital camera, I happened across this photo of a Golden-headed Scallopwing (Staphylus ceos) butterfly. 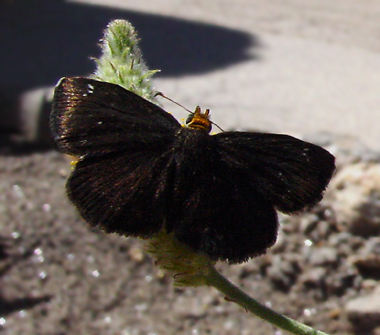 The Golden-headed Scallopwing was visiting the flowers of a Whiteflower Prairie Clover (Dalea albiflora) in Sabino Canyon in September, 2004. Whiteflower Prairie Clover is one of the best butterfly flowers that I have ever seen, and it was absolutely covered in butterflies and other insects. Even among all of the more brightly colored butterflies, this Golden-headed Scallopwing immediately caught my eye with its dark, rather funereal wings and incongruous golden head. It looked almost as if it was wearing a gilded helmet and a tattered, dusty black cape. Golden-headed Scallopwings have rusty or sooty black wings with fringed edges and tiny white spots on the forewings. 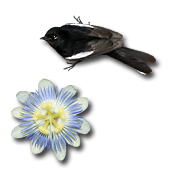 Their dark wings usually have a dusty, mouldering appearance, with varying amounts of paler speckling. A Golden-headed Scallopwing can be easily distinguished from other dark Skippers (Family Hesperiidae) by its golden head. Golden-headed Scallopwings are found in the southern parts of Arizona, New Mexico, and Texas, as well as in Mexico. The larvae feed on Fremont's Goosefoot (Chenopodium fremontii).